Up here at latitude 50°North, we miss out on some of the best parts of the sky. The centre of the Milky Way in Scorpius and Sagittarius is one of the areas we miss out on or, at best, only see poorly due to its low position on the horizon. For good views of these areas, and to see the objects which don’t rise above our horizons or which are poorly placed, we northern Europeans have to travel south. I have made trips to the Southern Hemisphere to do some observing and also four trips to the Texas Star Party. 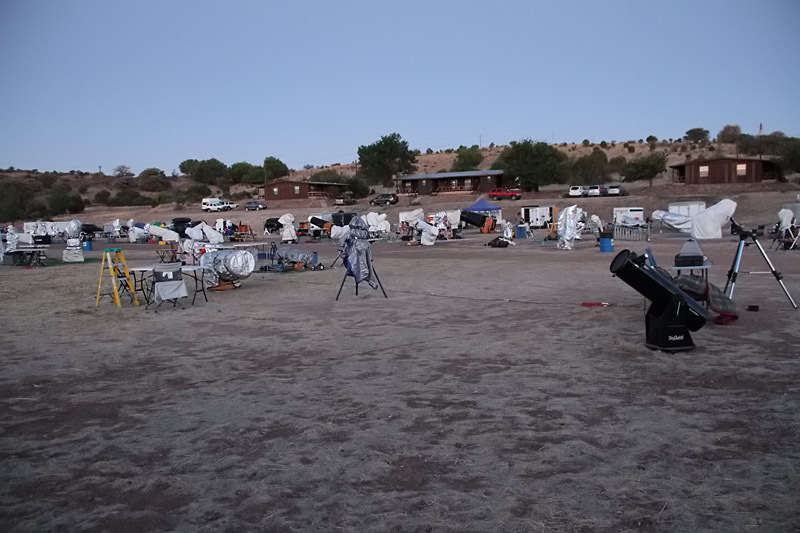 I spent the week of 15-22nd April 2012 at the Texas Star Party whose more southerly latitude at 30°N is 20° further south than my home latitude. Often I spend time looking at exotic objects or obscure galaxy groups as well as showpiece objects, too, with gigantic Dobsonians of 91 or 122 cm(!) but this year I also took the opportunity to observe those NGC objects that don’t rise above the horizon at home, or are on the horizon (in Corona Australis, Lupus, Norma and parts of Scorpius and Sagittarius) plus the ones that don’t rise very high here (Hydra, northern Sagittarius, northern Scorpius). Because I was using a fairly small scope, 25cm (10 inches in old money), I stuck to globular clusters. Globulars are one of my favourite types of object to observe, as they are often quite bright and each one looks different from another. Some have bright dense cores or are totally resolved, while others amount to no more than a roundish smudge with uniform brightness. Some are very dense, while others are looser. And there are those that are in all stages of ‘in-between’. These observations were made on the nights of 19/20 and 20/21 April. The seeing was poor to good while the transparency was pretty good. The naked eye limiting magnitude was 6.5 to 7.0. I used a (borrowed) 25 cm dob with magnifications of 31x, 48x, 104x and 139x. NGC 6541 – This was almost in the trees. Very bright, quite small and round. At 139x it is lovely, with a compact centre and totally resolved outer halo. A foreground star touches the cluster’s eastern edge. NGC 4590 (=M68) – Large and bright at 48x. Round. At 139x it brightens a little towards the centre, which is not dense. Totally resolved. NGC 5694 – Extremely easy to find this is a moderately bright, tiny globular which lies on the northern end of a line of two stars. Star like but fuzzy at 48x. At 139x it is a not-quite-round glow with a slightly brighter middle. Dense, compact core. Unresolved. NGC 5824 – This is very small but extremely bright. It has a very bright, dense core – one of the densest I’d yet observed. Not resolved at 139x but there are hints of granularity with averted vision. NGC 5927 – Bright, despite its low altitude. At 48x it is a round, fairly even glow that brightens a little towards the centre. At 139x it shows a slightly more irregular shape, with chains coming off from the centre. The centre is brighter than the outlying areas but is not compact or dense. NGC 5986 – This is large and bright, even at low power, with a granular appearance. It is evenly bright across the face of the cluster and there is a foreground(?) star just touching the eastern side. At 139x the cluster is fully resolved to the centre but there is also a background glow hinting at unresolved stars. The cluster is uniformly bright. NGC 5946 – This is small and faint and quite hard to find, probably due mainly to its low altitude from my observing site. At 139x it appears as an unresolved but granular evenly bright glow. There is only very slight concentration towards the centre. There is a foreground star on the SW edge. NGC 6287 – Obvious at low power, with a slightly irregular shape. Brightens slightly to the core. At 139x, the core is slightly brighter than the surrounding parts of the cluster but not dense. Also, at higher power, it looks rounder than it did at 48x. The cluster is partly resolved at higher power with stars dotted across its face. NGC 6293 – At low power (48x) this is small, very bright and round with an obvious bright, dense core. Totally unresolved. At 139x, it is a nice object; the core is very bright and dense. The outer areas are resolved with averted vision. NGC 6304 – A quite small but very bright and obvious cluster. It looks fairly evenly bright at 48x. 139x shows a slightly irregular shape with some brightening towards the core. Resolved with averted vision. NGC 6316 – Small, bright and dense this is in a nice field. Round at low power (48x). At high power (139x) this is very nice indeed. It is round and bright, with a brighter dense core. Not resolved but the outer areas are granular with averted vision. A star is close in on the southern side. NGC 6325 – Fairly big but with low surface brightness. At low power (48x) it is of even brightness and unresolved. With my 9mm Nagler (139x) it looks brighter towards the centre but the core isn’t dense. Granular with averted vision. NGC 6342 – Small (about half the size of 6356). Fairly faint, but obvious. It has a fuzzy outer area which brightens towards a compact core. It remains granular, even with averted vision. NGC 6522 – This forms a very nice pair with fellow globular NGC 6528, in the same field of view at 48x and located adjacent to Gamma Sgr. At 48x, they are both of similar brightness. However, 6822 does look slightly brighter at 130x. 6522 is triangular at 48x at low power. Brighter in the middle but core not dense. NGC 6528 – Fainter than 6522 at 139x. Direct vision shows uniform brightness across the cluster but averted vision shows moderate brightening towards the core. Partly resolved with averted vision. NGC 6558 – Easy to locate, between Gamma and Epsilon Sgr, and lies in a rich field. At 48x it is moderately bright and round. 139x shows a partly-resolved glow which appears granular across its face. The cluster brightens towards its centre but the core is not dense. NGC 6624 – A very bright and small globular which lies in a nice rich field. Two stars lie immediately to the east. At 139x, this shows a very bright compact core. With averted vision it is partly resolved, especially the outer areas. A nice object. NGC 6723 – Very bright, despite its low altitude. At 48x and 139x, it appears uniformly bright with no brightening towards the core at all. At 139x, it appears more irregular, due mainly to a dark area cutting into its north west side. It also appears to have dark areas in the eastern side. Resolved, particularly with averted vision. NGC 6139 – Obvious at 31x as a bright, circular object. Round, with a brighter core. 139x shows a round object with a bright, dense core. The outer edges are only partly resolved with averted vision. NGC 6144 – Very close to Antares (and M4) this was easy to find, even at 139x. It is mostly resolved especially with averted vision. There is no concentration towards the core and the cluster appears evenly bright throughout. There is a star on the edge of the western side of the cluster. NGC 6388 – Very bright and small. Very obvious and easy to see at 31x. At high power (139x) there is a dense bright core surrounded by a halo which looks significantly larger with averted vision. A faint star almost touches the northern side. NGC 6441 – This is very bright, small and round with a faint star to the south-west. At 139x it is round and shows some brightening towards the centre. Unresolved but granular. NGC 6453 – This is faint and lies on the NW border of M7. Visible at 31x as a brightening of the background sky. At 139x it is irregular and shows only slight brightening towards the core, which is not dense. Partly resolved with averted vision. NGC 6496 – Much fainter than near neighbour NGC 6541 this is well defined, irregular, smudge against the sky at 48x. At 139x, it is uniformly bright, unresolved and slightly elongated east-west. There are four foreground stars superimposed on it. And, of course, I looked at the great southern globular itself, NGC 5139, Omega Centauri. Through a 48″ it knocks your socks off and blinds you for about 10 minutes – don’t use your observing eye! A 48” telescope is total overkill for looking at such a bright object (we also looked at M42 earlier in the evening and NGC 5128 – Centaurus A), but I couldn’t resist it. In the far more modest 10″ at 104x, it appears very rich but not concentrated in the middle. It is totally resolved and the curious ‘footprint’ feature is obvious on the western side. Fabulous.